Your body fat percentage is the amount of fat tissue that makes up your total body weight. 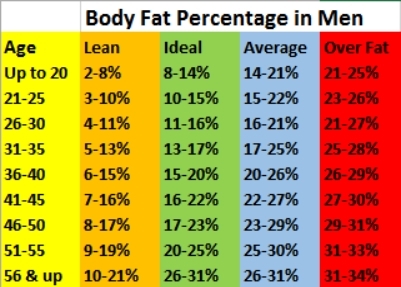 You can use the body fat percentage chart to see the average and over-fat levels for men and women. Measuring your body fat percentage is an excellent way to get a general indication of your general health. If you have low fitness levels and a high percentage of body fat, you are at more risk of developing serious chronic illnesses like diabetes, cancer, and heart disease. Keeping your body fat percentage in check will also help you be more mobile as you get older. 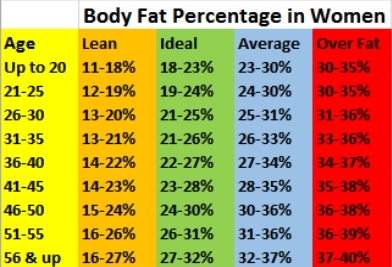 The body fat percentage chart is a helpful guide to help you calculate how much of your current weight should be fat tissue. The chart shows healthy percentage body fat ranges, taking into account your age group and gender. So, the chart is an excellent guide which makes you aware of how much body fat is normal for you. This can give you a realistic goal for you to aim for if you need to trim down your waistline. Before we look at what should be your ideal percentage of body fat in relation to your age group, let’s look at the importance of fat in the body. Usually, when talking about body fat, it is almost always mentioned in a negative connotation. It is true that obesity is a major and growing health problem in many Western countries. However, a certain amount of body fat is needed for a healthy body to function properly. According to cardiologist, Dr. Michael A. Chen, it is essential to eat some fats in your diet, but of course not to eat too many. The fats that your body metabolizes convert into energy to feed your vital organs and boost your energy levels. Fats are also needed to keep your hair and skin healthy and absorb vitamins A, D, E, and K.1 Body fat also plays an important role in cushioning your internal organs and providing you with warmth. For your body to function properly, it needs a minimum amount of essential fat. According to various sources, the minimum limit of body fat is around 2-5% for men2 and 10-13% for women.3 However, that is just the minimum amount. The average adult male body fat percentage should be between 18 and 25%. For women, their percentage of body fat in relation to age should be between 25 and 31%. The body fat chart also shows that the percentage of fat needed for the body to function properly increases with age. So, for example, 26% body fat is quite acceptable for a male over 55 years old. However, this would be classed as “over-fat” or obese in someone in their late 20s. There is some discussion between health practitioners whether it is better to calculate your body fat percentage or your body mass index (BMI). Recent research has favored using the body fat percentage chart as an indicator of overall health. Other studies have also shown that calculating body fat percentage is a better guide than BMI in distinguishing between healthy and obese persons.6 For example, an individual could have a good BMI reading, however, if fat tissue makes up too much of his overall weight, he or she could still be at risk of developing chronic disease. You are able to use the above chart to calculate your general fitness level and decide if you need to lose fat to improve your general health. When your body fat percentage is within the above norms, you will find that your metabolism works more efficiently, you will look more toned, and your general appearance will be better. As I already mentioned in this article, your ideal levels of fat in your body change with age. Let’s look in more detail at what these norms should be as your get older. In general, men need less fat than women to maintain a healthy body and avoid various health issues that are associated with obesity. This means that a middle-aged man who has 26% body fat or more would be classed as “over-fat.” However, this amount of body fat would be an ideal average for a woman of the same age. The chart below shows the healthy body fat percentage for men as they get older. An expert on nutrition, Barbara J. Moore Ph.D., is quoted on WebMD as saying that women need more fat than men to support their reproductive function.9 So, middle-aged women need about 10% more fat than a man of the same age. 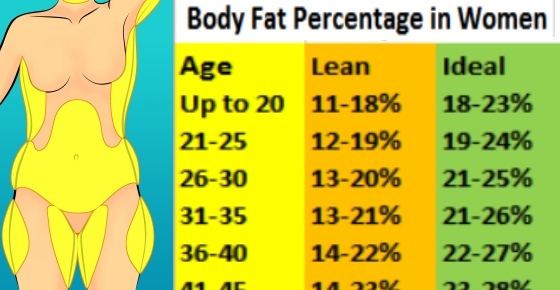 The chart below shows the healthy body fat percentage for women as they get older. The above body fat charts help to know the normal fat levels for your age and gender. The next step is to accurately calculate what percent of your body is made up of fat. There are a number of ways to determine the amount of fat in your body. These include using skin calipers to measure the thickness of your skin, measuring the impedance of an electrical current through your muscles (don’t worry, it’s painless! ), or even using a special X-ray machine to measure fat mass. Using skinfold calipers is the most common way to measure your body fat mass. According to the American Council on Exercise, approximately 50% of your body fat lies under the skin.8 Therefore, measuring the thickness of your folds of skin is a fairly accurate method to calculate body fat percentage. There are a number of accurate skinfold testing calipers on the market. For example, the Accumeasure Body Fat Caliper that is currently sold in this page in Amazon is fairly cheap and does an adequate job of measuring skin fat. Or there are digital body fat calipers like the FatTrack Pro Digital Body Fat Tracker (find it here) that takes readings from various areas of your body and stores them in memory. To get the best and most reliable results from using skinfold calipers, it’s important to measure the exact same spot each time. In men, readings are taken from skinfolds on the chest, thigh, and abdomen. The skinfold sites for women are the back of the upper arm, thigh, and the side of their abdomen (suprailium). These figures are then used to calculate the percentage of body fat that the person has. So, for example, a man who is 42 years old and weighs 185lbs would have 26% body fat if his skin measurement from his thigh was 31mm, chest 30mm, and abs 24mm. Another way to calculate the percentage of fat mass in your body is to use bioelectric impedance analysis (BIA). BIA works on the principle that fat has a low water content and doesn’t conduct electrical currents very well. Muscle, on the other hand, contain more water and conducts electricity better. The impedance, person’s height, and weight are used to calculate what percent body fat makes up his total mass. Compared to skinfold calipers, it is much easier to calculate your body fat percentage with this method. For example, some electronic scales like the Tanita Duo Scale Body Fat Monitor (like this one) come with built-in bioelectric impedance analysis. However, these devices aren’t suitable for athletes, pregnant women, or people with pacemakers. If you have a body fat percentage of over 30% or have more than 35lbs to lose, you will find that BIA is a better option for you than skinfold calipers. A cheap and easy way to measure your body fat percentage is the anthropometric method (sometimes referred to as the U.S. Navy method). This method calculates the amount of fat in your body by using various body measurements. For men, their abdomen and neck circumference, as well as their height, is measured. For women, their height and circumference of their hips and neck are measured. To get a reading for your percentage of body fat, you need a cloth measuring tape. You can then use an online body fat calculator to work out your approximate percentage of fat. The drawback with this method is that it is the least accurate method to work out body fat percentage because it doesn’t exactly measure body fat. However, you can use this method to chart your progress as you aim to lose weight and fat mass from your body. Hydrostatic Weighing. This involves weighing you while your body is submerged in water. While this is the most accurate way to calculate and monitor your body fat levels, it is impractical for most people and is expensive. Dual Energy X-ray Absorptiometry. This is another accurate, but expensive way for body fat measurement. X-rays measure your fat tissue mass and can differentiate between lean fat tissue and fat tissue mass. Medline Plus. Dietary fats explained. J Appl Physiol (1985).1994 Aug;77(2):933-40. PUBMED. How much body fat do we need? Ann Intern Med.2016 Apr 19;164(8):532-41. Am J Clin Nutr. September 2000 vol. 72 no. 3 694-701.
org. Percent body fat calculator. J Am Diet Assoc. 1994 Aug;94(8):855-8. Weight loss increases and fat loss decreases all-cause mortality rate.